You’ve probably read a number of heartwarming Thanksgiving posts over the last day or two. I’ve decided to go a different direction with this tale of the first Thanksgiving and Pilgrim/Native American relations. Enjoy this account from Lossing’s History of the United States (1909). We have observed that the Pilgrims at Plymouth rejoiced in an abundance of food in the autumn of 1621 the first year of their settlement. Thereby their hearts were filled with gratitude, and after the fruits of their labors had all been gathered, the governor sent out huntsmen to bring in supplies for a general and common thanksgiving. That was the first celebration of the great New England festival of Thanksgiving, now annually held in almost every State and Territory of the Union in the month of November. Great quantities of wild turkeys and deer were gathered at Plymouth, and for three days the Pilgrims indulged in rejoicing firing of guns and feasting–entertaining at the same time, King Massasoit and ninety of his dusky followers, who contributed five deer to the banquets. Seven substantial houses had been built during the summer; the inhabitants were in good health; a few emigrants from England had come in a second ship, and there were happy homes in the wilderness the ensuing winter. Among the new comers was the Rev. Robert Cushman, one of the founders of the colony, who in December, 1621, preached the first sermon in New England. Governor Bradford’s chief anxiety, at first, was for the establishment of friendly relations between the English and the Indians. That was already secured with Massasoit and his people; but Canonicus, the haughty chief of the Narragansets, living on Canonicut Island opposite the site of Newport, was loth to be friendly at first. To show his contempt for and defiance of the English, he sent a messenger to Governor Bradford with a bundle of arrows in a rattlesnake’s skin. That was at the dead of winter, 1622. It was a challenge to engage in war in the spring. Like the venomous serpent that wore the skin, the symbols of hostility gave warning before striking–a virtue seldom exercised by the Indians. Bradford acted wisely on the occasion. He accepted the challenge to fight the multitude of savages, by sending the significant quiver back, filled with gunpowder and shot. Company, sent over a colony of sixty unmarried men to plant a settlement on his own account, somewhere on the shores of Massachusetts Bay. 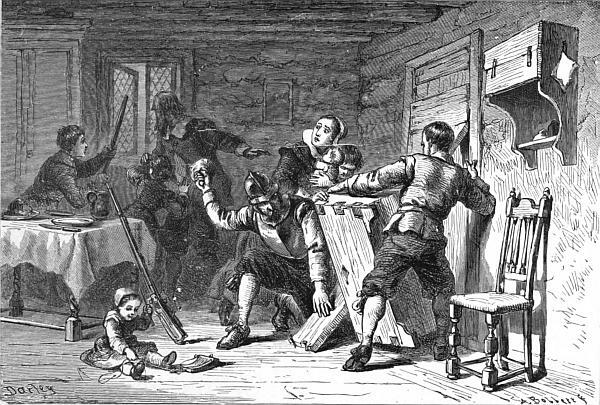 He boasted of the superior strength of such a settlement by bachelors to that of Plymouth, which was “weakened by women and children.” They were mostly idle and disorderly young men like those who went early to Virginia. Many of them were very dissolute. After living several weeks upon the scanty means of the Plymouth families, they went to the site of Weymouth, where they began a settlement. Idle and wasteful, they were soon compelled to confront gaunt Famine; and beggary and starvation were the alternatives presented to them. They exasperated the Indians by plundering their cornfields and other sources of supplies. The savages, failing to discriminate between the righteous and the unrighteous, or fearing the vengeance of the other white people if they should destroy the young men at Weymouth, formed a plot for the extermination of all the English in their land. The peril was great, and was discovered only a few days before the fatal blow was to be struck Massasoit, who had been nursed into health after a deadly sickness, by the brave hands of Edward Winslow, revealed the plot to his benefactor. 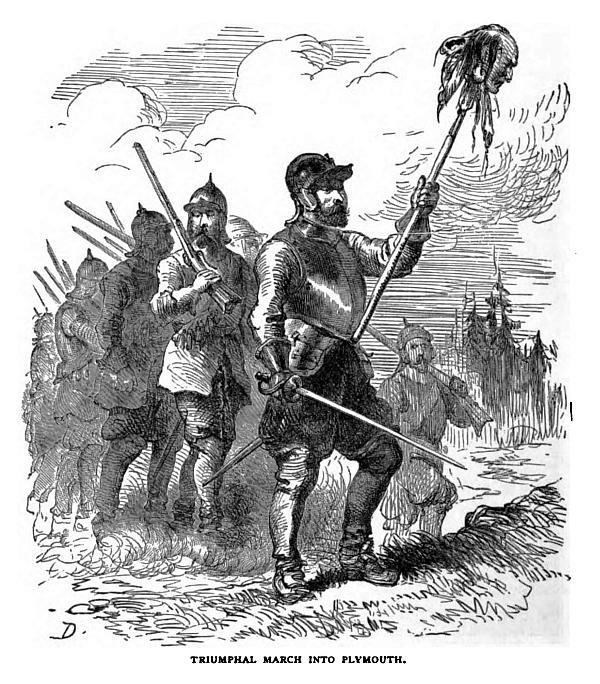 The Plymouth people immediately sent Captain Standish, with a few soldiers, to protect the offending Englishmen, and in a contest that ensued an Indian chief and several of his followers were killed. The victor carried the chief’s head upon a pole, in triumph, into Plymouth, and placed it on the palisades of the fort. When the good Robinson at Leyden heard of this he wrote “O, how happy a thing it would have been, had you converted some, before you killed any.” If they were not “converted,” the savages were very much frightened, and sued for peace. So the settlement of strong unmarried men was saved by the Plymouth people who were “weakened by many women and children.” The childless Lord Bacon, in one of his essays, says: “Certainly the best works and of greatest merit for the public have proceeded from the unmarried or childless men.” Weston’s experience was the reverse. His colony, too weak to endure, was broken up within a year after it was planted, and the most worthless of its members, happily for the Plymouth people, returned to England.